Penetrate the lane, drive past defenders, and throw down thunderous dunks as you take your game to the next level in NBA LIVE 07. Command every action on the court like never before with a dynamic array of explosive moves at your disposal. Run the show in Dynasty Mode™ and manage every detail of your franchise on your way to the NBA Championship. Featuring next - generation gameplay—complete with dazzling new visuals as well as ultra- realistic player movements and emotions—the hardwood is yours for the taking in NBA LIVE 07. Successfully Perform at least one Level 3 SCORER SUPERSTAR move in a game session. Successfully Perform at least one Level 3 SHOOTER SUPERSTAR move in a game session. Successfully Perform at least one Level 3 HIGH FLYER SUPERSTAR move in a game session. Successfully Perform at least one In the Zone SHOOTER SUPERSTAR move in a game session. FIFA 07 throws you into the rollercoaster ride of a football season. Employ real world tactics, make realistic decisions, and think like a player in order to win matches. An entirely new game engine will be included for the 360. 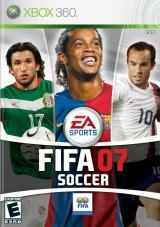 FIFA Soccer 07 on the Xbox 360 moves away from the traditional animation-based game engine and now enables .. In FIFA 13 every touch matters with the most comprehensive and intuitive dribbling system ever developed. Inspired by the world’s best footballer, Lionel Messi, Complete Dribbling enables players to face their opponent and use precise dribble touches combined with true 360° mobility with the ball, so it’s easier to be more creative and dangerous in..
NCAA Football 08 for Xbox 360..
With the exclusive video game license of the NFL and PLAYERS INC., “Madden NFL 07” continues to be the No. 1 football franchise in history with more than 51 million copies sold. In its 17th installment, gamers can control the running game like never before. For the first time ever, they can step up as the lead blocker to create a hole, and then tak..
FIFA 14 will be available on September 24th in North America and on September 26th in Europe and Australasia for the Xbox 360, PlayStation 3 and PC. The game will also be available on Xbox One, Nintendo WII, 3DS, VITA, IPhone, PS2, PSP, PS4. A new feature in FIFA 14 called Pure Shot and a brand-new ball physics system will transform shooti..
EA returns to the ring with this fourth entry in the boxing franchise. Featuring a re-written gameplay engine, Fight Night Round 4 adds a variety of fighting styles and boxer differentiation to authentically emulate the greatest fighters of all time. Pressure your opponent with the brawling inside style of young Mike Tyson, bobbing and weaving to s.. Which Xbox 360 Accessory are you most likely to buy first?